Ask fellow campers about "Camping Alouette" and nearby attractions. This is a campground that is divided into two areas. Lower part is open with few trees and upper part is moderately to heavily wooded and somewhat hilly. Highway noise in all areas. Most sites, which included ours, looked level and had crushed stone put down. Interior roads were paved and in good shape. Plenty of pull-through and back-in sites and most looked easy to get into with the larger RVs. Our full hookups were in good working order. Good signal on our OTA roaming. Bathrooms/showers were clean & updated. Camp store seemed well stocked. Heavy seasonal/snowbird presence here, folks were very friendly. Staff was professional and friendly and very helpful about the area around the campground. Would certainly return again or recommend this place to anyone. We camped at Camping Alouette in a Travel Trailer. We used this as a stop over to visit Old Montreal. This is a very nice park. Clean washrooms and laundry room. The showers are $.25/ minute, which is a downer. The employees are very nice and speak fluent English and French. The only down side is some road noise. We were given excellent instructions to drive to a certain parking lot and then take the subway to Old Montreal. This was a perfect way to see Old Montreal and hassle free. We camped at Camping Alouette in a Travel Trailer. Go to Lupo's for great Italian food that is close by. We have stayed at Camping Aloutte a few times and always been satisfied. They are placing more emphasis on being owned by Parkbridge. We booked one of their newer premium sites that included a swinging dining table. 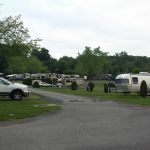 The site was spacious enough for our 40-foot motorhome and tow. Satellite reception was excellent, and the utilities worked well. For the first few days of our stay we had excellent Wi-Fi at the site. But then we had none. According to office personnel they had problems with the antenna serving our site for over a month. They were surprised to learn that we had good Wi-Fi for a few days. The campground location is OK for visiting Montreal, but traffic is heavy. In the past we have used the metro to get around. This time we drove to see friends northeast of the city and later to visit the botanical gardens. Traffic toward Montreal was very heavy. We camped at Camping Alouette in a Motorhome. The price is in Canadian and reflects a "premium" site. This is a tough park to review. It's nice enough but is somewhat run down and needs a lot of work. There were some huge pot holes on the exit and entrance roads that were hard to avoid. There is a gate system that too is quite narrow so use care in and out. Out premium site faced a big field/golf driving range and had some kind of gliding chairs but other than that it was narrow and weed infested. It is close to Route 20 so there was some road noise but not bad. It is convenient to Montreal and that's it's value You can be downtown riding the Metro (15 minutes to the station). WiFi was quite good. The park is next to a large RV dealer so repairs might be possible. We camped at Camping Alouette in a Motorhome. Montreal is a fun place to visit. Another note as this is not the fault of the park but Route 30 from the park to the Metro was the most horrible road we have ever traveled in any vehicle in North America. This is a nasty and dangerous highway. The park was easily accessible from Highway 20. Sites were large and level. Utilities were good, and antenna reception was great. The staff was extremely friendly and helpful. There is a little cantina. Everything was very well maintained. We camped at Camping Alouette in a Fifth Wheel. We had an easy drive into and out of the city on both weekend days. The Grayline hop on hop off tour was great. The ticket is for two days. There was plenty of reasonably priced parking near the information center where we bought the tickets. The Point-a-Calliere museum was awesome, and our lunch at the restaurant there was delicious and reasonably priced. Nice park not far from a metro stop for easy travel into downtown Montreal. Adequate space between sites, which are long and level. utilities good. Excellent Wi-Fi, only slowed during peak times. Friendly and easy check-in. Gated entry with $ 20.00 deposit for entry card. Next to a golf driving range. Small pool and nice playground. No cable but clear view for satellite and many over the air channels. Constant traffic noise from Autoroute 20. We would return. We camped at Camping Alouette in a Motorhome. Were here for 2 nights. $60 CND with taxes. Large park, we had #186 pull thru with full 50 amp hookups. We could not preregister as minimum of 3 nights was required, but the man at the desk said no problem as they had a lot of available sites. This was true, desk staff was friendly and helpful. 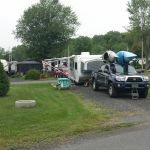 However, unlike other RV Parks, we could not include the 2 nights we had already paid for if we wanted to extend our stay for a week and get the weekly rate. Would have had to stay another 7 nights as the computer could not accommodate the request ! ? The pool was not "heated" enough to swim in. Small library with mostly French books. Small gym room was locked. A $20 deposit for the gate pass required, returned when we handed in the pass on leaving. Directions were given for driving to Montreal by car or by train. The wifi was down and did not work whilst we were there. We would stay here again. There is a KOA closer to the city, but they did not return my calls. We camped at Camping Alouette in a Motorhome. We drove into Montreal. Parked near the Tourist Information Center on Peel Street. $18 for the day. Took the Hop on Hop off bus which starts right outside the information Office. This can be recognized by a large ? sign. The HOHO bus was $55/person and good for 2 days. The lines at Schwartz Deli can be long. One is for take out the other is for Dine in. We had a nice, level gravel pull-through in an open area in this very large park...close to the pool and the office. Internet was good but a separate charge of $3 a day (US$). Bathrooms and laundry near us were clean but too small for the traffic in the AM. Since shower/toilet is in the same two rooms, quite a wait could develop if 2 were taking showers, and you might want to wait a while to take a shower in some cases! LOL. Laundry was good and cheap at about $1 per machine. Pool was large with lifeguard and nice as was playground. Lots of activities scheduled for the big and well kept seasonal crowd. We plan to visit this park again. We camped at Camping Alouette in a Motorhome. Road work and bad road coming into the park from eastern most exit off highway onto service road as of 8/1/16/ ....go past the park and take exit 105 to the same service road in the other direction to have a much better surface! Chez les Vieux is an excellent French restaurant in St. Basile le Grand about 5 miles away...reasonable and delicious! You can drive 5 miles to St. Basile le Grand (small town) and enjoy a GREAT I.G.A grocer, fine pattiserie shop and several good restaurants. You can park for free and take the bus to Longeuil to hook up with the Metro into Montreal there as well. About $25 round trip for 2. Train runs on weekdays for commuters...but bus only on weekends. RV Dealer next door has a great little store with eveything you might need including parts and a parts counter guy who speaks a bit of English and knows his stuff. We got a new bathroom faucet for $25 and had a choice of 4 that would fit. He had the EZ connections for Pex as well. Great location, site, nice pool, friendly. We camped at Camping Alouette in a Motorhome. Nearest metro stop is in Longueuil. 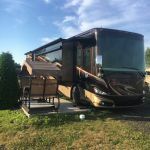 Alouette offers a much better value and nicer facilities than the average RV park close to any major city in the US or Canada. It is a very large, partially-wooded property convenient to an auto-route with many seasonal residents who maintain their places very well. We were on the upper level which had trees around and nice view of a mountain in the distance. Our site wasn't huge, but adequate, and we were away all day sightseeing anyway. I appreciated the green space where I could walk my dog, as well as the immaculate laundry and bathroom near our site. Would not hesitate to recommend this to others visiting Montreal. We camped at Camping Alouette in a Motorhome. 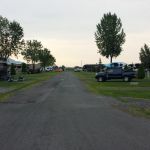 For those who do not tow, Enterprise Rent-a-Car has a nearby base in an auto dealership in Ste.-Julie, just one exit before the campground's exit off the auto-route. We booked ahead online, picked up the car there, and pre-arranged a ride back to our RV at the conclusion of our rental. Worked out very well. Nice clean campground. Friendly staff. Level sites. Convenient to Montreal. One nice feature is the RV self wash. We would stay here again. We camped at Camping Alouette in a Motorhome. 1. There is a Camping World equivalent next to the entrance of the campground. 2. As you drive to and from Montreal you will pass an Ikea. There is a Costco in the same complex. 5 or 6 miles away from the campground. This is a very nice campground with easy access to Autoroad 20. It has paved roads with gravel, level pads, and easy-enough navigation for big rigs. Our premium site had a concrete patio with a swing for two, a grassy area between sites, and no trees, so we had no satellite issues. We also faced a driving range so we had entertainment! There was a charge for wifi, and it worked well. We did not use the amenities, but there was a nice pool which got a lot of activity. There is also an RV dealer and service center nearby in case you have any issues. We will definitely consider staying here again if we are in the area in the future. We camped at Camping Alouette in a Motorhome. When we told people that we were going to Montreal, we were warned that the people there were rude and nasty. We didn't find that to be true. Everyone we met was friendly and helpful. Most spoke English. Even though my husband speaks NO French and my high school French classes were over 50 years ago, we had no problems. This is a nice campground. The fee represents a month's stay. They don't charge for electricity, so the $40 fee for one month's wifi was very reasonable. The gravel sites are large and level. The laundries are clean and well-maintained. There's a nice pool with a lifeguard. The washers and dryers require one Canadian dollar coin and one Canadian quarter. The people speak fluent English and are very nice. We stayed here a month (the rate is based on a monthly stay) and would return if we come back to Montreal. We camped at Camping Alouette in a Motorhome. Rate shown is Good Sam discount. Friendly and helpful bilingual staff. Our site was a level gravel pull-through and included a table and fire ring. All hookups worked fine. No cable TV, but around 10 channels in English off the antenna. Wi-Fi cost $6 a night and I didn't use it so can't be sure how it works. Close to the autoroute there is some noise, but not noticeable inside the RV. We would stay here again if in the area. We camped at Camping Alouette in a Motorhome. Sites were big. There is a driving range on site, and our site was right across the street, so that was fun to do. Well located for Montreal. The showers were pay, $0.25/minute, which is kind of steep. They were clean though. Easy access from the highway. The sites in front tended to have some road noise. We walked to the back sites and they were very buggy, so I guess it is a trade-off. No TV, but excellent WIFI. The WIFI was $4/day for up to 2 devices, which is pretty good. We were happy with our stay here, and would recommend it. We camped at Camping Alouette in a Fifth Wheel. Road work and bad road coming into the park from eastern most exit off highway onto service road as of 8/1/16/ ....go past the park and take exit 105 to the same service road in the other direction to have a much better surface! Chez les Vieux is an excellent French restaurant in St. Basile le Grand about 5 miles away...reasonable and delicious! You can drive 5 miles to St. Basile le Grand (small town) and enjoy a GREAT I.G.A grocer, fine pattiserie shop and several good restaurants. You can park for free and take the bus to Longeuil to hook up with the Metro into Montreal there as well. About $25 round trip for 2. Train runs on weekdays for commuters...but bus only on weekends. RV Dealer next door has a great little store with eveything you might need including parts and a parts counter guy who speaks a bit of English and knows his stuff. We got a new bathroom faucet for $25 and had a choice of 4 that would fit. He had the EZ connections for Pex as well. 1. There is a Camping World equivalent next to the entrance of the campground. 2. As you drive to and from Montreal you will pass an Ikea. There is a Costco in the same complex. 5 or 6 miles away from the campground. Are you affiliated with Camping Alouette ?